A regular breeding resident and migrant. Regular during the winter months; most frequently reported in southern and central Minnesota. Seasonal movements in the fall are influenced by the annual mast crop. An uncommon species during the Minnesota Breeding Bird Atlas (MNBBA). Restricted largely to the eastern United States, from the Great Plains east to the Atlantic coast, the Red-headed Woodpecker also occurs to a very limited extent in Canada, from southern Saskatchewan east to southern Quebec. The core of the species’ breeding range occurs in the Central Plains states of South Dakota, Nebraska, Kansas, and Iowa (Figure 1). Assigned a Continental Concern Score of 13/20 and designated a Watch List species by Partners in Flight; designated a Minnesota Species of Greatest Conservation Need by the Minnesota Department of Natural Resources, and a Target Conservation Species by Audubon Minnesota. Irregular or short-distance migrant; movements influenced by mast crop abundance. Omnivorous diet of seeds, insects, and fruits acquired by fly catching, ground foraging, bark gleaning, bark drilling, and foliage gleaning. Mast crops are important in the winter. Cavity in a dead tree or dead limb of a tree. Breeding distribution and relative abundance of the Red-headed Woodpecker in North America based on the federal Breeding Bird Survey from 2011 to 2015 (Sauer et al. 2017). The Red-headed Woodpecker is on the northern periphery of its breeding range in Minnesota. Roberts (1932) originally described the species as a summer resident throughout the state. He remarked, however, that the birds were “most in evidence in the longer settled and cultivated portions of the state, extending its range into more heavily timbered and wilder regions only as they are cleared and inhabited.” Indeed, all 6 confirmed (nests with eggs or young) and inferred (nests only) county nesting records at the time were from southern, central, and northwestern Minnesota: Goodhue, Hennepin, Isanti, Polk, Ramsey, and Rock Counties. In his account, Roberts mentions an 1878 publication by Dr. Elliot Coues on birds observed in the Red River valley. A surgeon and ornithologist from New England, Coues was working in the region for the U.S. Northern Boundary Commission in the late 1800s. His account of the birds he observed in the Dakota and Montana Territories mentioned that Red-headed Woodpeckers were common along the Red River at Pembina in June 1873 (Coues 1878). Unfortunately, by the time Roberts prepared his comprehensive account of the species nearly 50 years later, the Red-headed Woodpecker had become infrequent and sparsely distributed in the region. Roberts also noted that during his lifetime an increasing number of Red-headed Woodpeckers were overwintering in the state. Most reports were from southeastern Minnesota, but there were scattered reports as far north as Stearns and Morrison Counties. These were localities where winter food resources were abundant, including “corn-cribs, corn-shocks, chicken-yards” and feeding stations (Roberts 1932). When Green and Janssen (1975) prepared their updated species account years later, little had changed with respect to the species’ breeding distribution. During the winter months, the species was seen regularly as far north as Lake Mille Lacs and occasionally north to Wadena and southern St. Louis Counties. Janssen (1987) depicted the species’ breeding range as covering all of Minnesota except for most of the Arrowhead region and the north-central counties of Itasca, Koochiching, and Lake of the Woods. Nesting had been confirmed in 34 counties since 1970. Six more counties were added by Hertzel and Janssen in 1998. Beginning their work in the late 1980s, field biologists with the Minnesota Biological Survey have reported a total of 320 breeding season locations. The vast majority were concentrated in the southern Prairie Parkland and the Eastern Broadleaf Forest Provinces (Minnesota Department of Natural Resources 2016). During the MNBBA, observers reported 637 Red-headed Woodpecker records from 9.7% (463/4,776) of the surveyed atlas blocks and from 13.2% (309/2,337) of the priority blocks. Breeding was confirmed in 2.2% (104) of the surveyed blocks (Figures 2 and 3; Table 1). Birds were reported in 82 of Minnesota’s 87 counties and were confirmed breeding in 48 counties (1 block straddled Anoka and Isanti Counties). Twenty-four of the counties were additions to the list published by Hertzel and Janssen (1998). Red-headed Woodpeckers were most common and widely distributed in southern Minnesota, south of a line between the Twin Cities and Lac qui Parle County. Farther north, records were concentrated in the Brainerd Lakes region and the Aspen Parklands Province. With just a couple of exceptions, this species was absent from most of northeastern Minnesota as well as from the far northern reaches of central Minnesota. Perhaps the most notable record was in Cook County along the North Shore. The bird was observed in May 2010 on a large farm located a few miles north of the shore. Overall, the breeding distribution of the Red-headed Woodpecker has changed very little since Roberts wrote the first comprehensive account in 1932. It certainly is more common in the Brainerd Lakes region now than in earlier times. Focused survey efforts by atlas observers in the region no doubt contributed to the large number of reports. But the region also provides more suitable habitat then it did 100 years ago. Today, much of this once extensively forested area has been cleared for industrial, residential, and recreational development, creating the open, fragmented landscape that is more suitable for the woodpeckers. Elsewhere within their breeding range, significant population declines have led to distributional changes as well. For example, the northern edge of their breeding range has receded in Ontario, and they have virtually disappeared as a breeding species in New England (Cadman et al. 2007; Frei et al. 2017). Many distributional changes have been influenced by the presence or demise of trees that provided mast during the winter months or nesting cavities during the summer months, such as the American beech, American chestnut, and American elm. Breeding distribution of the Red-headed Woodpecker in Minnesota based on the Breeding Bird Atlas (2009 – 2013). Summary statistics of observations by breeding status category for the Red-headed Woodpecker in Minnesota based on all blocks (each 5 km x 5 km) surveyed during the Breeding Bird Atlas (2009-2013). Summary statistics for the Red-headed Woodpecker observations by breeding status category for all blocks and priority blocks (each 5 km x 5 km) surveyed during the Minnesota Breeding Bird Atlas (2009-2013). The Red-headed Woodpecker is an inhabitant of woodlands where the canopy is relatively open, where a sufficient number of dead trees or dead limbs are available for nesting, and where there in an abundant supply of mast. In the northern portion of its range, deciduous woodlands are preferred; farther south preferred woodlots often have a pine component. In the Upper Midwest, oak savannas, prairie-forest transitions, and bottomland hardwoods are all typical habitats (Potter et al. 2007). In agricultural landscapes farm shelterbelts and old windbreaks are commonly used (Figure 4). Sites are usually xeric in nature and have a low density of shrubs and small trees in the understory. The open understory facilitates ground foraging, as grasshoppers, beetles, and other ground-dwelling morsels are important components of the woodpeckers’ diet (Meyers 2010). Given their dependence on semi-open country, the birds also are attracted to sites that have been burned, creating more savanna-like conditions (Niemi 1978). The open character of the oak savanna habitat that Red-headed Woodpeckers prefer also can be found in a number of human-altered habitats, including golf courses, shelterbelts, and cemeteries (Meyers 2009a). Habitat data collected within 200 m of MNBBA point counts where Red-headed Woodpeckers were detected demonstrate the species strong association with croplands and grasslands (Figure 5). This reflects the predominance of MNBBA detections in small woodlots and shelterbelts that are associated with farmsteads throughout southern Minnesota (Figure 2). Typical breeding habitat of the Redheaded Woodpecker in Minnesota (© Lee A. Pfannmuller). Habitat profile for the Red-headed Woodpecker based on habitats within 200 m of point counts where the species was present during the Minnesota Breeding Bird Atlas (2009-2013). Monitoring data collected by the federal Breeding Bird Survey (BBS) have been used to generate a 2016 North American population estimate of 1.6 million birds (Rosenberg et al. 2016). In 2013, Minnesota was estimated to support 2.0% of the North American population (Partners in Flight Science Committee 2013). Applying that percentage to the 2016 population estimate yielded a statewide estimate of 32,000 breeding adults. Breeding densities in Minnesota are relatively low compared to regions farther south. The core of the species population, where some of the highest breeding densities occur, spans the Central Plains states of Nebraska and Kansas and east into Iowa (Figure 1). BBS routes in Minnesota have an average of 1 to 2 woodpeckers per route each year; routes in the species’ core breeding range are as high as nearly 6 birds per route in Kansas to 8 birds per route in Iowa (Sauer et al. 2017). Field studies across the species’ range report a wide diversity of local breeding densities as well. In the southeastern United States, Hamel (1992) reported 2.3 pairs per 40 ha. In Illinois, densities averaged 5 pairs per 40 ha prior to the widespread loss of elms to Dutch elm disease; following the loss of the trees, densities ranged from 24 to nearly 64 pairs per 40 ha (Kendeigh 1982). The dead and dying trees provided an abundant supply of suitable nesting sites. At the Cedar Creek Ecosystem Science Reserve north of the Twin Cities, breeding densities in high-quality oak savanna habitat ranged from 8.5 to 9.5 pairs per 40 ha in 2008 and 2009, respectively (Meyers 2009b). Survey-wide, BBS data demonstrated a significant population decline since the survey began in 1966 of 2.35% per year. The rate of the decline has lessened since 1990 and has nearly stabilized in the past decade. Range-wide, the cumulative decline since 1970 is estimated at 67% (Rosenberg et al. 2016). The woodpecker’s status in Minnesota, however, is more precarious. Since 1967 it has experienced a significant average annual decline of 6.07%, representing a cumulative loss of 95% since the survey began (Figure 6). Its status has improved only marginally since 2005, with an average annual decline of 4.96% per year. No other state, province, or ecological region has experienced a more significant decline (Sauer et al. 2017). The scenarios are similar throughout the Upper Midwest. Other states with significant declines include Wisconsin (4.58% per year), Michigan (5.07% per year), Iowa (4.00% per year), Missouri (4.14% decline per year), and Illinois (4.15% decline per year). A map depicting regional population trends, as evidenced by the BBS data, illustrates that the decline is most severe in the central portion of the woodpecker’s range (Figure 7). Red-headed Woodpecker populations have fluctuated repeatedly since at least the 19th century when naturalists began documenting such trends. No doubt the species benefited from extensive clearing of the eastern deciduous forest following European settlement. Its positive response to the fungal blights that killed the American chestnut and American elm is also well documented. More recently, however, competition for nest sites with the European Starling, coupled with the woodpecker’s known susceptibility to car collisions (owing to its habit of feeding on backcountry roads), have decreased population numbers (Howitz 2003; Frei et al. 2017). Changes in the availability of food resources, especially mast crops, also contribute to short-term population fluctuations. Nevertheless, habitat loss may be the single most important factor responsible for the species’ decline. Much of the oak savanna habitat the species is dependent upon in Minnesota is located in the broad deciduous forest belt that extends from southeastern Minnesota northeast to the Park Rapids area. This is the most densely populated region of the state, and local communities outside of the Twin Cities metropolitan area, such as St. Cloud and Brainerd, continue to grow and expand outwards. Such growth has come at the expense of many critical habitats, including oak savannas. In the Anoka Sand Plain Subsection alone, oak savannas, which comprised nearly 54% of the region’s habitat in the 1890s, were reduced by 1990 to less than 1% (Minnesota Department of Natural Resources 2006). Although this habitat loss is significant, the woodpecker does make use of small farmland woodlots and shelterbelts in the southern and western regions of the state. Many of these woodlots are not actively managed and are dense with dead and decaying trees, creating excellent habitat. Whether the species is as reproductively successful in these habitats as in native oak savannas is unknown, however. 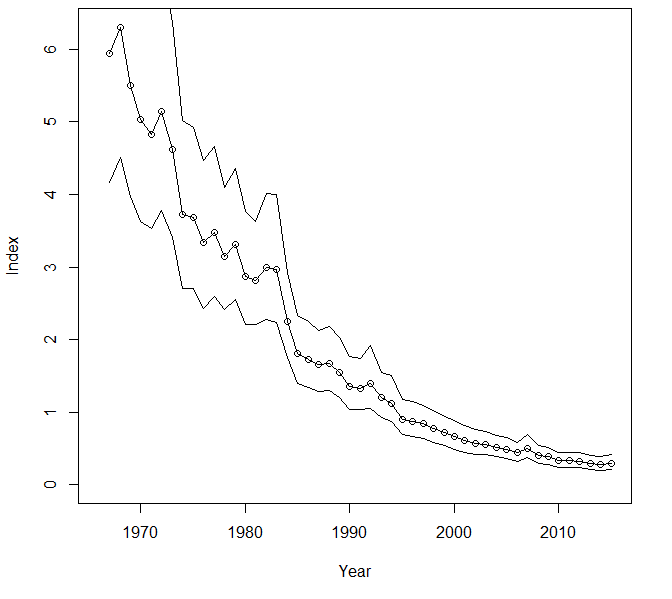 Breeding population trend for the Red-headed Woodpecker in Minnesota for 1967–2015 based on the federal Breeding Bird Survey (Sauer et al. 2017). Population trend map for the Red-headed Woodpecker in North America for 1966–2015 based on the federal Breeding Bird Survey (Sauer et al. 2017). In light of its significant population decline, the Red-headed Woodpecker has received the attention of numerous conservation organizations and resource agencies. In 2004 Partners in Flight established a conservation objective to increase the population by 100% in 30 years (Rich et al. 2004); in 2010 they further designated it as a Common Species in Steep Decline (Berlanga et al. 2010). Recently they assigned it a Continental Concern Score of 13/20 and classified it as a Yellow Watch Species (Rosenberg et al. 2016). This classification is reserved for those species that require constant vigilance on the part of resource managers in order to prevent further declines. In Minnesota the Red-headed Woodpecker has been designated a Species of Greatest Conservation Need by the Minnesota Department of Natural Resources (Minnesota Department of Natural Resources 2015). Audubon Minnesota designated it a Target Conservation Species and prepared a statewide conservation plan (Pfannmuller 2014). The plan adopted the national population objective for the species and outlined actions necessary to accomplish this goal, including protecting and restoring oak savanna habitat. Locally the woodpecker has benefited from the focused efforts of the Red-headed Woodpecker Recovery Project. Launched in 2007 by the Audubon Chapter of Minneapolis, the project’s goal is to reverse the decline and promote the recovery of Red-headed Woodpeckers. Working in association with resource agencies and the University of Minnesota, the project’s dedicated volunteers have conducted extensive surveys throughout the state and have prepared management guidelines for public and private landowners (www.redheadrecovery.org). The project has also been a catalyst for an in-depth study of the woodpecker population at the Cedar Creek Ecosystem Science Reserve. Finally, a warming climate may present another set of challenges or opportunities for the Red-headed Woodpecker. The 2010 State of Bird Report on climate change predicted the species has a very low vulnerability to warming temperatures (North American Bird Conservation Initiative 2010). Climate change models, however, predict that Minnesota’s summer climate will become more dry and arid, akin to that currently found in Nebraska and Kansas. In response, the state’s mixed deciduous-coniferous forests will shift northward and be replaced by more hardwoods, such as red maple and oaks. Given that the core of the woodpecker’s current range is in Nebraska and Kansas, the drier oak forests that are predicted to occur in Minnesota may actually provide more opportunities for the Red-headed Woodpecker in the years ahead should we succeed in insuring the sustainability of current populations. Hamel, Paul B. 1992. Land Manager's Guide to the Birds of the South. General Technical Report SE-22. Asheville, NC: U.S. Department of Agriculture, Forest Service, Southeastern Forest Experiment Station. Howitz, James L. 2003. “The Red-headed Woodpecker in Minnesota.” Loon 75: 123–130. Kendeigh, S. Charles. 1982. Bird Populations in East Central Illinois: Fluctuations, Variations, and Development over a Half-Century. Vol. 52, Illinois Biological Monographs. Champaign: University of Illinois Press. Meyers, Chet. 2009a. “Will Red-heads Return?” Minnesota Conservation Volunteer 72(May/June): 18–25.